Photographer Elizabeth van der Bij of ENV Photography was meeting her clients Kassandra and Craig to shoot their engagement photos on Wednesday when the clouds started rolling in. "I shot crazy fast while fighting the wind so we could get out of there," the photographer told HuffPost Weddings via email. 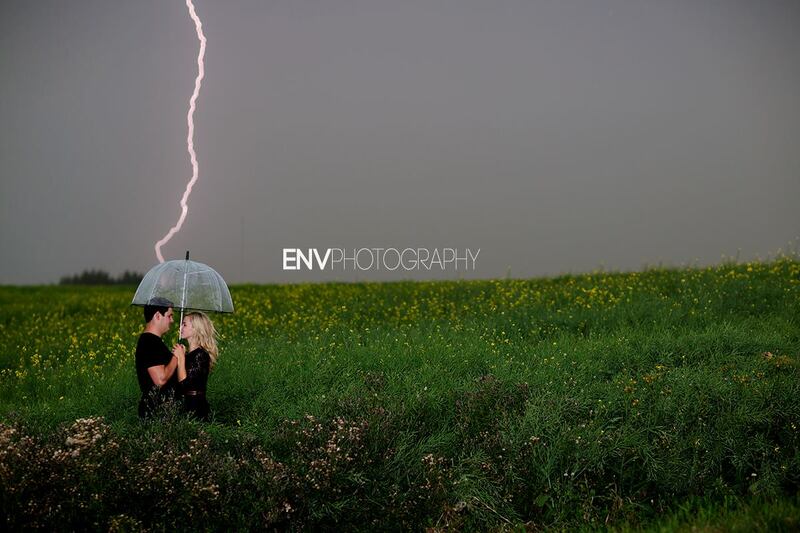 "I was hoping to catch the lightning in one, but didn't really expect it to happen!" They got the shot and then ran back to their cars, which were parked nearby. Van der Bij said that they were watching the lightning the whole time and once they saw it moving closer, they immediately ended the session and got the heck out of there. And because we figured that there would be some naysayers claiming that the picture was Photoshopped, we had van der Bij send us proof that the shot was indeed real. Below are the raw uploads of all the frames she shot before she captured the perfect moment.